Bundle In-Cab In-Vehicel Cigrette Plug, Curly Cable and Standard Mount Bundle for the Panasonic FZ-N1 CradleCradle Body with Cig Plug, Curly Cable and Standard 6" Windscreen Suction Mount. The perfect all-in-one solution, the 51T® Cradle Charger is designed and manufactured to safely hold and charge a range of hand held devices within various locations. Ideal for mobile or fixed charging, the 51T® Cradle Chargers boast the longest of lifespans with it’s interchangeability and thoroughly modular design. Constructed from ABS plastics and grade A Steel every cradle is handmade from the most robust and hard-wearing materials available, bringing the most dependable and fully repairable mobile computer cradles on the market today to life. All cradles come with a standard 12-month warranty and can also be extended by up to 5 years. You also benefit from a 36-month manufacturing defect warranty. Service and Repairs are handled by our UK Repair Centre. 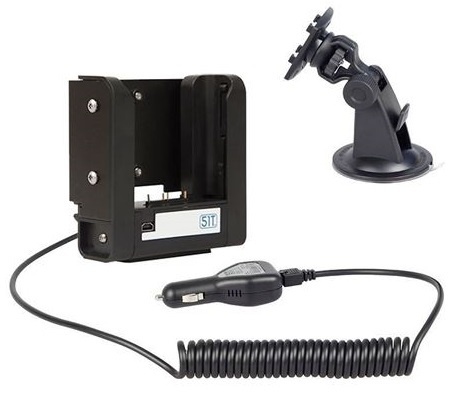 In-Cab In-Vehicle charging cradle designed specifically for use with the Panasonic FZ-N1 Mobile Computer includes: cradle, cig-plug, curly-cable, standard-mount-bundle. This is the 51T Charging Cradle for the Panasonic FZ-N1 rMobile computers range. 51T Panasonic FZ-N1 In-Cab In-Vehicle Cradle Charge - Bundle In-Cab In-Vehicle Cigrette Plug, Curly Cable and Standard Mount Bundle for the Panasonic FZ-N1 CradleCradle Body with Cig Plug, Curly Cable and Standard 6" Windscreen Suction Mount. Bundle includes: cradle, cig-plug, curly-cable, standard-mount.